I made the announcement to leave LuLaroe this week in pursuit of a new adventure. 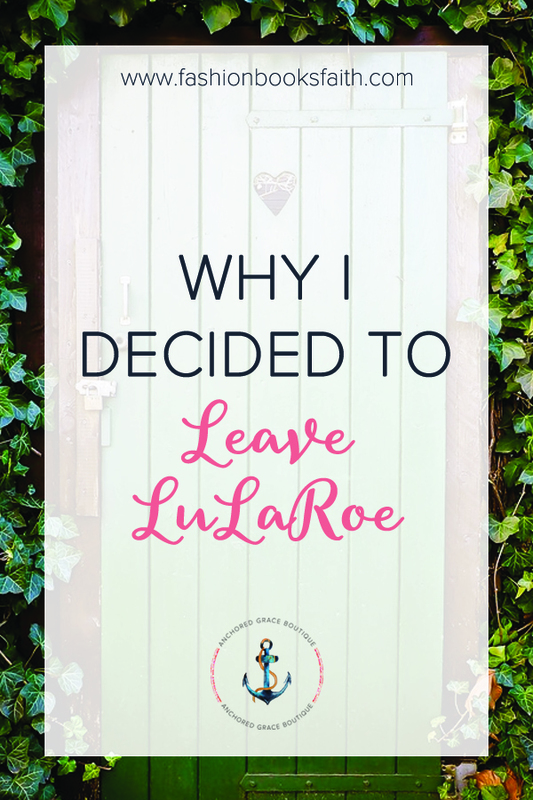 Read on to find out why I decided to leave LuLaRoe. First off, I want to say there will be no LuLaRoe bashing going on here or in my life. LuLaRoe has been such an amazing blessing to me and my family for the last two and a half years. LuLaRoe provided me with an opportunity to work from home, taught me how to own my own business, and provided well for our family. 1. I’m no longer excited about the product I’m selling. I remember when I first started LuLaRoe every box was like Christmas. Over time I lost that child-like excitement that came with my orders. What made LuLaRoe so fun, in the beginning, the wild and crazy patterns, is no longer fun for me. 2. LuLaRoe no longer fits my ideal customers. One of the things I love best about LuLaRoe is that they have styles designed to fit every woman and make her feel beautiful. I have built a customer base of curvy, beautiful, women. Many of the new styles released by LuLaRoe don’t make me feel beautiful and I can’t sell those to my customers. 3. I want a website. Since my education and career are in web development, it only makes sense for me to have a website. I want one (insert tiny tantrum here) and with LuLaRoe I cannot have one. 4. Freedom – my eventual goal is to own a boutique that carries items I decide on – not a direct sales boutique. But I’m not ready for that yet. This change is a step in that direction. I will begin carrying accessories that I source from vendors. I’m so excited to start this next step in our journey together. Watch soon for an announcement of what’s next. Want to follow our journey? Drop me a message or head over to our group.